It looks like Samsung did it again, just months after the company was caught boosting its benchmark result for its flagship Galaxy S4 device, the company is said to be boosting its benchmarks again, this time, for the Samsung Galaxy Note 3 that was launched a few weeks back. Last time round, a string of code called “BenchmarkBooster” was discovered by Anandtech, and suspecting that Samsung might pull off the same thing again, Ars Technica decided to do some investigating and found something similar. 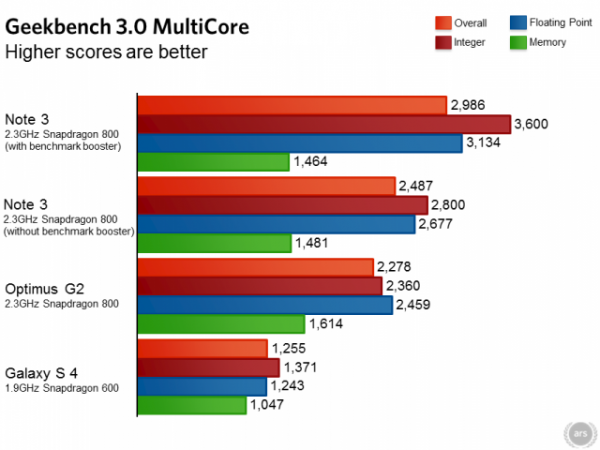 Ars Technica discovered that despite having almost identical hardware with the Galaxy Note 3 N9005 (Snapdragon 800 version), the LG G2’s score was far behind. They then found that when certain benchmarks are detected, the CPU will be put on full throttle with all four cores running at 2.26GHz at all times; when idle, 3 of the 4 cores will shut off to conserve power while the fourth one drops down to 300MHz mode. It is not normal for benchmark apps to put all 4 cores to full speed. Ars Technica then did some tweaking about on some of the most popular benchmarking apps, and found that the “normal” result is about 20% lower than what we see. This puts the benchmark scores on par with the LG G2. 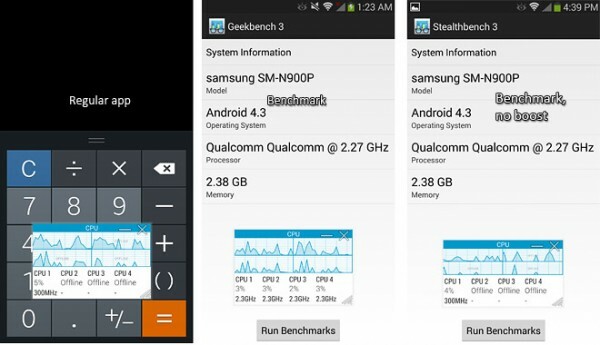 Read Ars Technica for the full in-depth discovery of Samsung’s boost that affects most popular benchmark apps including Geekbench, Quadrant, Antutu, Linpack, GFXBench and of course, Samsung’s very own benchmarks. If it’s any consolation at all, with all the boosters disabled, the Note 3 still outperforms the G2 in terms of benchmark results. At the end of the day, benchmark results are just numbers and I guess with all 4 cores pushed to their maximum limit, you can get to see the maximum performance of the Note 3. Let’s see what Samsung’s response will be this time round.